Agricultural wastewater treatment is a farm management agenda for controlling pollution from surface runoff that may be contaminated by chemicals in fertiliser, pesticides, animal slurry, crop residues or irrigation water. Nonpoint source pollution from farms is caused by surface runoff from fields during rain storms. Agricultural runoff is a major source of pollution, in some cases the only source, in many watersheds. Soil washed off fields is the largest source of agricultural pollution in the United States. Excess sediment causes high levels of turbidity in water bodies, which can inhibit growth of aquatic plants, clog fish gills and smother animal larvae. 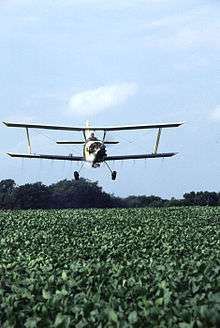 Aerial application (crop dusting) of pesticides over a soybean field in the U.S. Farmers may use Integrated Pest Management (IPM) techniques (which can include biological pest control) to maintain control over pests, reduce reliance on chemical pesticides, and protect water quality. There are few safe ways of disposing of pesticide surpluses other than through containment in well managed landfills or by incineration. In some parts of the world, spraying on land is a permitted method of disposal. 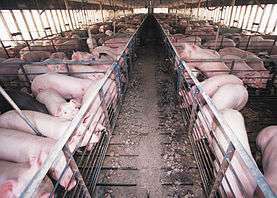 Farms with large livestock and poultry operations, such as factory farms, can be a major source of point source wastewater. 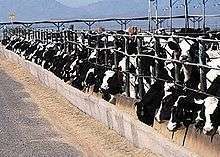 In the United States, these facilities are called concentrated animal feeding operations or confined animal feeding operations and are being subject to increasing government regulation. Animal wastes from cattle can be produced as solid or semisolid manure or as a liquid slurry. The production of slurry is especially common in housed dairy cattle. Whilst solid manure heaps outdoors can give rise to polluting wastewaters from runoff, this type of waste is usually relatively easy to treat by containment and/or covering of the heap. Animal slurries require special handling and are usually treated by containment in lagoons before disposal by spray or trickle application to grassland. Constructed wetlands are sometimes used to facilitate treatment of animal wastes, as are anaerobic lagoons. Excessive application or application to sodden land or insufficient land area can result in direct runoff to watercourses, with the potential for causing severe pollution. Application of slurries to land overlying aquifers can result in direct contamination or, more commonly, elevation of nitrogen levels as nitrite or nitrate. The disposal of any wastewater containing animal waste upstream of a drinking water intake can pose serious health problems to those drinking the water because of the highly resistant spores present in many animals that are capable of causing disabling disease in humans. This risk exists even for very low-level seepage via shallow surface drains or from rainfall run-off. Some animal slurries are treated by mixing with straws and composted at high temperature to produce a bacteriologically sterile and friable manure for soil improvement. Piggery waste is comparable to other animal wastes and is processed as for general animal waste, except that many piggery wastes contain elevated levels of copper that can be toxic in the natural environment. The liquid fraction of the waste is frequently separated off and re-used in the piggery to avoid the prohibitively expensive costs of disposing of copper-rich liquid. Ascarid worms and their eggs are also common in piggery waste and can infect humans if wastewater treatment is ineffective. Fresh or wilted grass or other green crops can be made into a semi-fermented product called silage which can be stored and used as winter forage for cattle and sheep. The production of silage often involves the use of an acid conditioner such as sulfuric acid or formic acid. The process of silage making frequently produces a yellow-brown strongly smelling liquid which is very rich in simple sugars, alcohol, short-chain organic acids and silage conditioner. This liquor is one of the most polluting organic substances known. The volume of silage liquor produced is generally in proportion to the moisture content of the ensiled material. Silage liquor is best treated through prevention by wilting crops well before silage making. Any silage liquor that is produced can be used as part of the food for pigs. The most effective treatment is by containment in a slurry lagoon and by subsequent spreading on land following substantial dilution with slurry. Containment of silage liquor on its own can cause structural problems in concrete pits because of the acidic nature of silage liquor. Although milk has a deserved reputation as an important and valuable food product, its presence in wastewaters is highly polluting because of its organic strength, which can lead to very rapid de-oxygenation of receiving waters. Milking parlour wastes also contain large volumes of wash-down water, some animal waste together with cleaning and disinfection chemicals. Milking parlour wastes are often treated in admixture with human sewage in a local sewage treatment plant. This ensures that disinfectants and cleaning agents are sufficiently diluted and amenable to treatment. Running milking wastewaters into a farm slurry lagoon is a possible option although this tends to consume lagoon capacity very quickly. Land spreading is also a treatment option. See also Industrial wastewater treatment. Wastewater from slaughtering activities is similar to milking parlour waste (see above) although considerably stronger in its organic composition and therefore potentially much more polluting. As for milking parlour waste (see above). Washing of vegetables produces large volumes of water contaminated by soil and vegetable pieces. Low levels of pesticides used to treat the vegetables may also be present together with moderate levels of disinfectants such as chlorine. Most vegetable washing waters are extensively recycled with the solids removed by settlement and filtration. The recovered soil can be returned to the land. Although few farms plan for fires, fires are nevertheless more common on farms than on many other industrial premises. Stores of pesticides, herbicides, fuel oil for farm machinery and fertilizers can all help promote fire and can all be present in environmentally lethal quantities in firewater from fire fighting at farms. All farm environmental management plans should allow for containment of substantial quantities of firewater and for its subsequent recovery and disposal by specialist disposal companies. The concentration and mixture of contaminants in firewater make them unsuited to any treatment method available on the farm. Even land spreading has produced severe taste and odour problems for downstream water supply companies in the past. 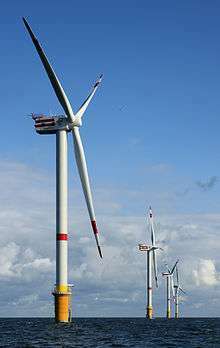 1 2 U.S. Environmental Protection Agency (EPA). Washington, DC. "Protecting Water Quality from Agricultural Runoff." March 2005. Document No. EPA 841-F-05-001. ↑ U.S. Natural Resources Conservation Service (NRCS). Fort Worth, TX. National Conservation Practice Standard: Contour Farming." Code 330. June 2007. ↑ NRCS. National Conservation Practice Standard: Mulching." Code 484. September 2008. 1 2 3 4 5 EPA. "National Management Measures to Control Nonpoint Source Pollution from Agriculture." July 2003. Document No. EPA-841-B-03-004. ↑ NRCS. "National Conservation Practice Standard: Nutrient Management." Code 590. August 2006. ↑ NRCS. National Conservation Practice Standard: Pest Management." Code 595. July 2008. ↑ EPA. "Integrated Pest Management Principles." March 13, 2008. ↑ "Waste Pesticide Management" (PDF). Oregon.Gov. State of Oregon Department of Environmental Quality Land Quality Division Hazardous Waste Program. Retrieved 5 October 2016. ↑ EPA. "Animal Feeding Operations." December 15, 2008. ↑ Dairy Waste Anaerobic Digestion Handbook Archived October 15, 2013, at the Wayback Machine. 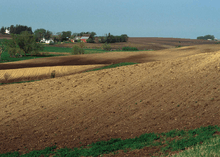 Electronic Field Office Technical Guide - U.S. NRCS - Detailed soil conservation guides tailored to individual states/counties.